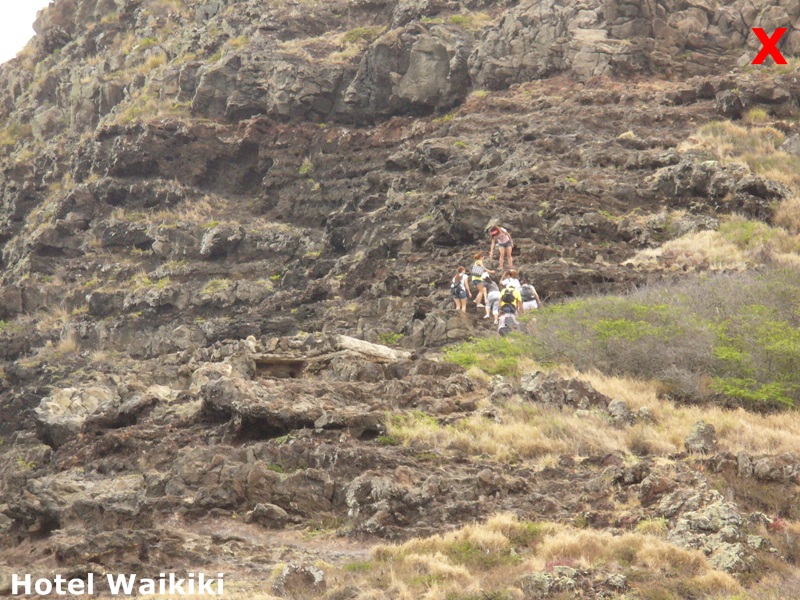 It was simply amazing watching this group of hikers made up of 7-girls and 2-guys trek up Makapuu from the backside (highway side). The girl at the lead appeared to be the guide or at least the rest of the group would stay put for a minute while she scouted the goat trail then she would stop and signal from above that it was safe enough for the goat herd waiting below her to proceed up. What fascinated me most was that the hikers weren't wearing serious kind hiking gear to be taken as veteran hikers which started to set off alarmed bells the more uphill they advanced. Two of the girls even lugged around shoulder bags. As you can see for yourselves, the terrain is too rugged and steep to be taking safety lightly especially since the elevation gets higher very rapidly with each step on the itinerary. Having said that, if I were to tell you that the group would reach the Red X in the above photograph, you'd probably wouldn't believe me. (photos enlarge to 800px) However, there they are in the photo below. At that point they're not even half way to the Makapuu Lighthouse and here if in fact that's their eventual destination. And no, I don't think for a moment they would descend by retracing the same route, not when there's a paved road on the ocean side of Makapuu leading back down to the visitors' parking lot. Interesting. When I lived in El Paso Texas I did some hiking on the southern tip of the Rocky Mountains. The elevation was quite a bit higher than what it appears to be in these photos. The cars looked like ants by the time I got to the crest. The views were awesome and it made me want to hike more often, but I never had the opportunity. Maybe I'll find time for that here in the Philippines. Oh, and when I went hiking I think I wore jeans, Sketchers, a t-shirt, and took a backpack with a water bottle and a sandwich. You never know right? Brad- it's healthy if you don't inadvertently tumble all the way down. Man, if I'd tumbled down from where I hiked up to we'd never have met. That's a looooong fall. It is healthy though, that's for sure. I was sweating hard by the time I got to the top! Hiking and camping are two things I'm hoping to get to enjoy sometime in the near future. Of course, here in the Philippines both of those activities will require me to pack a firearm. This looks mighty dangerous to me. My husband loves to climb mountains. I prefer to admire them from the bottom. Brad- oh yeah, you'd need the firearms. However, that takes the fun out of it. Kay- ....and you prefer to fly on airplanes. 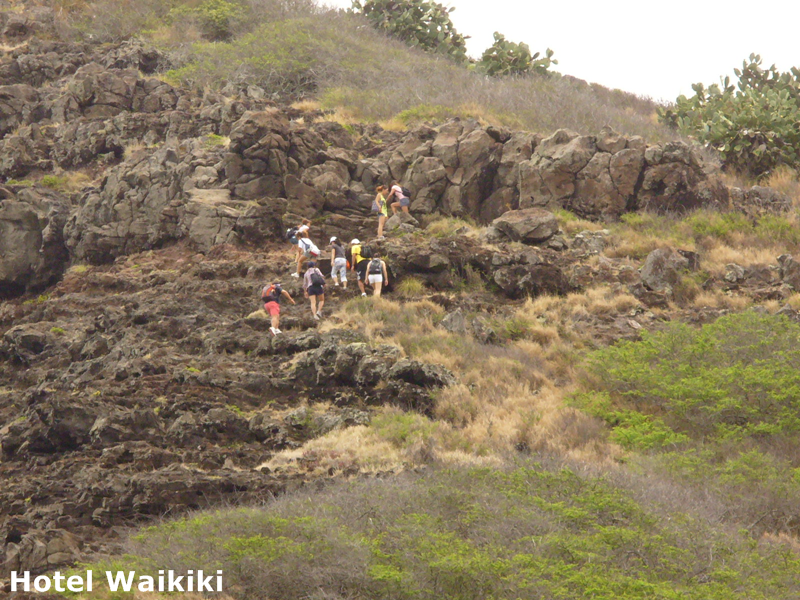 What struck me about the group was 2 wahines with shoulder bags. You really need two arms free for this steep of a hike. Somebody falls and they'll knock down the rest of the group like they were bowling pins.